At 12:00 I am invited to have lunch with Solomon and all the other residents of a large apartment building. Tonight is the gala dinner concert of Dehab Faytinga and Anchien'g Abura in the Intercontinental Hotel. 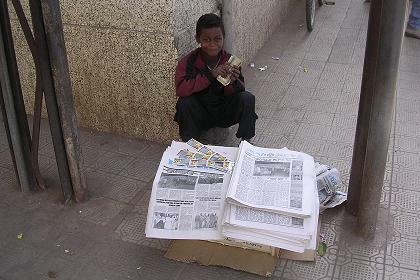 The remaining hours I will spent of the streets of Asmara, and to to some shopping. 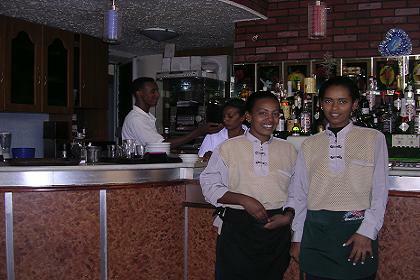 After a strong cappuccino in the recently renovated and re-opened American Bar, I visit some places to ask if there is any program during the last days of my visit to Eritrea. 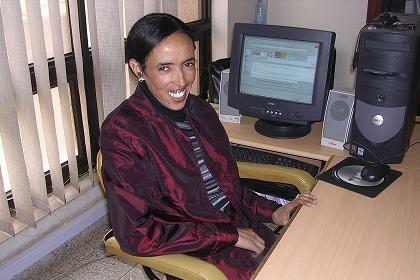 The main sources of information are the Ministry of Tourism, PFDJ *) Cultural Affairs and National Holiday Committee, the Asmara Theatre (music / drama), Casa Degli Italiani, (exhibitions), Expo area (exhibitions / festivals), the billboards on Harnet Avenue (nightclubs / concerts) and the (English) Eritrean Profile newspaper. There is nothing special the coming week, so I will visit some local villages around Asmara the coming days: Himbirti, Emba Derho, Tsa' Edakristyan, Adi Guadad, and I will ask Feshaye to bring me to the Mai Nefhi dam tomorrow. I walk through the streets of Asmara, drinking coffee or mineral water on several bars, visiting shops, looking for souvenirs and gifts to bring back home. 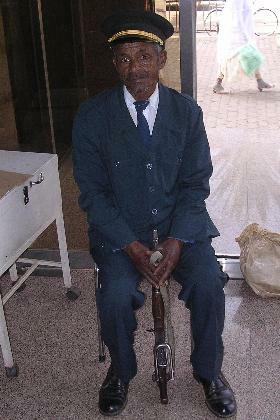 In the Housing and Commerce Bank, I finally meet Kibreab, who is travellin a lot, to do IT projects all over the country. I am too early for the lunch in the Asmara Palace. It is not my style, but in Eritrea one should always come at least one hour later than the time announced. I watch the preparations of the lunch. Cars are pushed away, the soil is spread with water to prevent dust to whirl up, the women are bringing in the food, the men carry crates with Asmara beer and Coca Cola. Around 14:00 the group is almost complete and lunch is served after a short prayer of Solomon, blessing the guests and blessing the food. The men, the women and the children are sitting in groups, enjoying the food and each others company. After the lunch I return to Gebrehiwot and Zewdi's residence to take a shower and change clothes. For an event like this, one should wear a fine suit, but unfortunately, I am more the backpacker type. Most of the guests is ambassadors, their wives and their staff. I do my best to hide my jeans, but when the Eritrean anthem sounds, I have to rise. So what, I came for Dehab Faytinga. First there is a buffet diner, with delicious meat, vegetables and bread, as one would expect in such a high class hotel. During our diner, men dance and play traditional instruments. One of them is Haile, my brother in law. When he passes my table he shakes hands and we exchange a few words. But as an artist he has to join the group of dancers and musicians. After diner the main concert starts. Dehab Faytinga with her fabulous voice, and her three beautiful background vocals and dancing girls, alternated with a performance by Achien'g Abura from Kenya and two ladies in zebra dresses. The guest enjoy the performance and dance on the Africa rhythms. 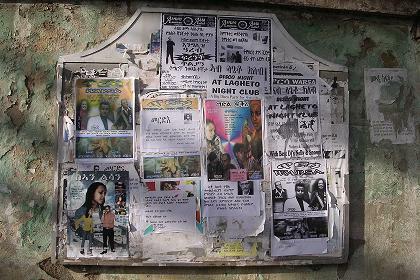 This week's programs advertised at billboards - Asmara Eritrea. 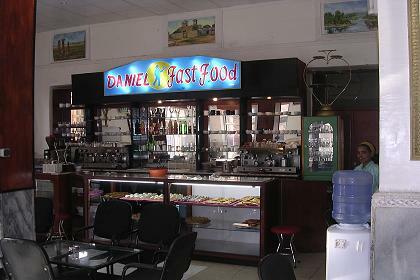 Breakfast in Daniels Fast Food Restaurant - Harnet Avenue Asmara Eritrea. 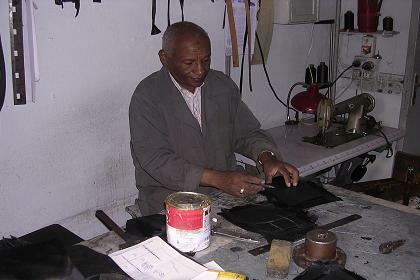 Zebra Leather factory - Asmara Eritrea. 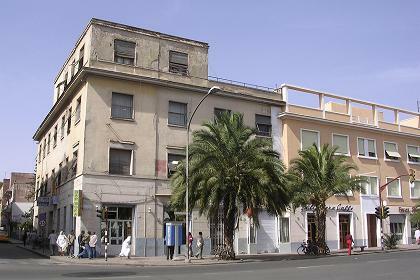 Tsege - Housing and Commerce Bank - Asmara Eritrea. 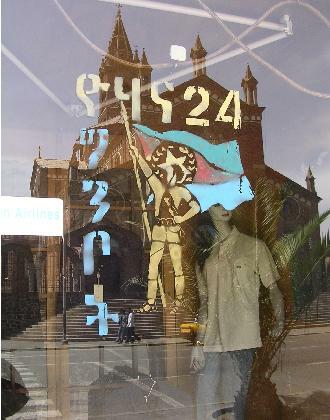 Guard - Housing and Commerce Bank - Asmara Eritrea. a source of information on this weeks events, local and international news. to answer your questions on where en how to go. And where not to go! Cathedral mirrored in a decorated shop window. 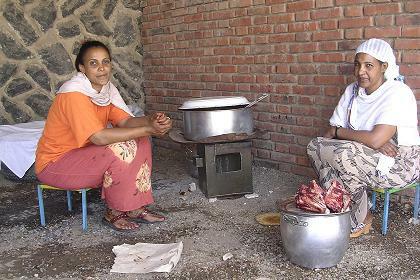 Women preparing lunch for the Asmara Palace residential building. 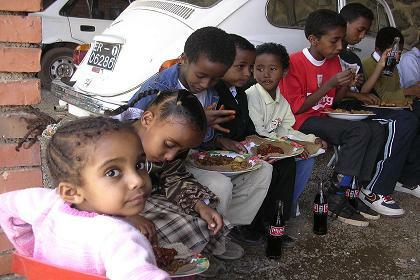 Children having lunch for the Asmara Palace residential building. 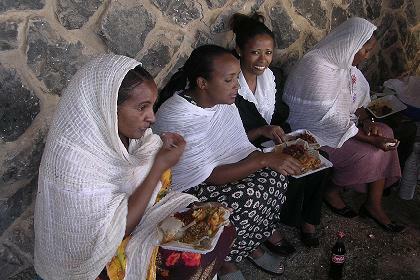 Women having lunch for the Asmara Palace residential building. in the Intercontinental Hotel Asmara. 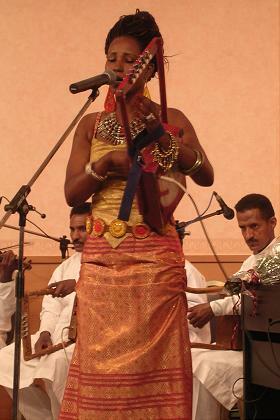 Dehab Faytinga - Gala dinner concert in the Intercontinental Hotel Asmara. 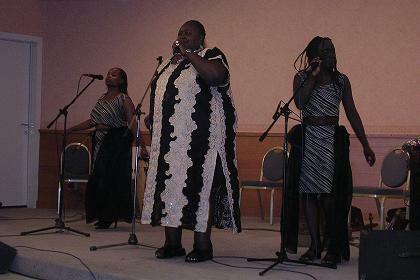 Achien'g Abura - Gala dinner concert in the Intercontinental Hotel Asmara.